Akko, Sea of Galilee, Golan Heights, Caesarea, Jerusalem, Dead Sea, Masada, Jaffa, Tel Aviv. Most of the tour runs on asphalt and some of it on easy trails. This tour can be done as a self-guided tour or a group/privately guided tour at any time of your preference if bikes are available. You can also rent a bike and follow the route described here. Please not that we are closed from Friday 12:00 Till Sunday morning. Bikes can be returned Saturday from about 40 minutes after sundown. Usage of our Yamaha Tenere XT660Z, Suzuki Vstrom motorcycles for the whole duration of the tour. All services not mentioned as included like gasoline and all items of a personal nature such as presents, food, drinks etc. Any fines for speeding and other traffic violations etc. Any tolls incurred while using highway. All riders must have a valid motorcycle license (at least A1). The tour is based on staying the night before the tour in Netanya and starting the tour the next morning. If you use your own helmets I will bring the communication equipment to the hotel so you can install it in advance to save time. The tour is based on having a full day in Israel on the last day. The tour is subject to change depending on weather, road conditions, travel arrangements etc. Pick up your bikes at Bikelife, Netanya, have a short orientation, arrange your gear and off we go. Ride north along the coastal highway to a view point on Mt. Carmel. From there continue north to the City of Akko, a world heritage site on the Med Sea coast. From Akko we will cut east through the upper Galilee along the Lebanese border and winding roads. We will go down towards the Kinneret- Sea of Galilee. Overnight in area of the Sea of Galilee. Today we will head further north to a lookout on the Lebanese border and the Hula valley. Depending on the season, our route will take us on a road parallel to the Jordan River. This section is an off-road trail. 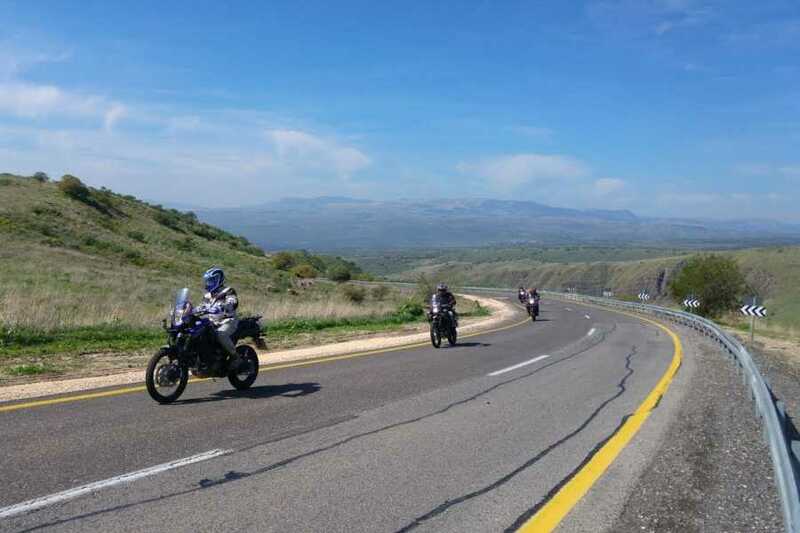 From here we will ride up to the Golan Heights and have lunch under Mt. Bental. Then we will ride east to Mt. Bental – a high dead volcano which gives an amazing 360 degrees view and a lookout into Syria. 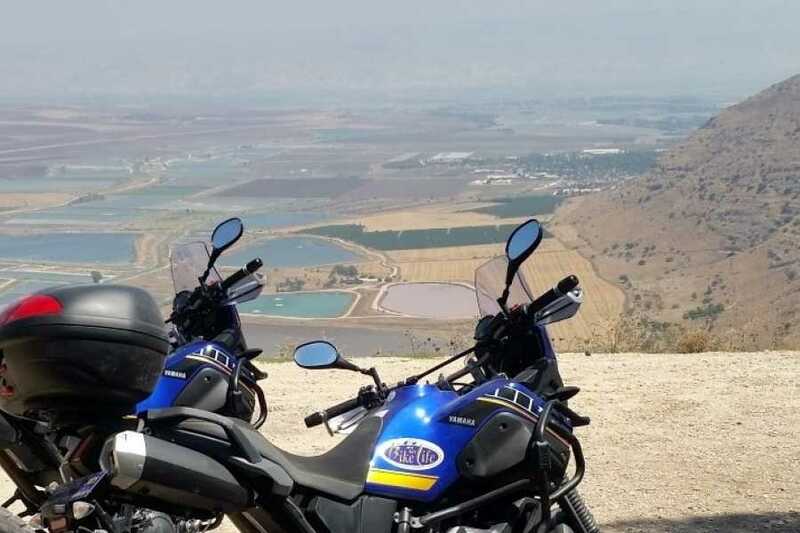 From here we will head to a stunning viewpoint of the Kinneret - Sea of Galilee and then go down the winding road that leads to the meeting point of the borders of Israel, Syria and Jordan. Overnight in area of the Sea of Galilee. Sea of Galilee viewpoint from the Golan HeightsOvernight in area of the Sea of Galilee. 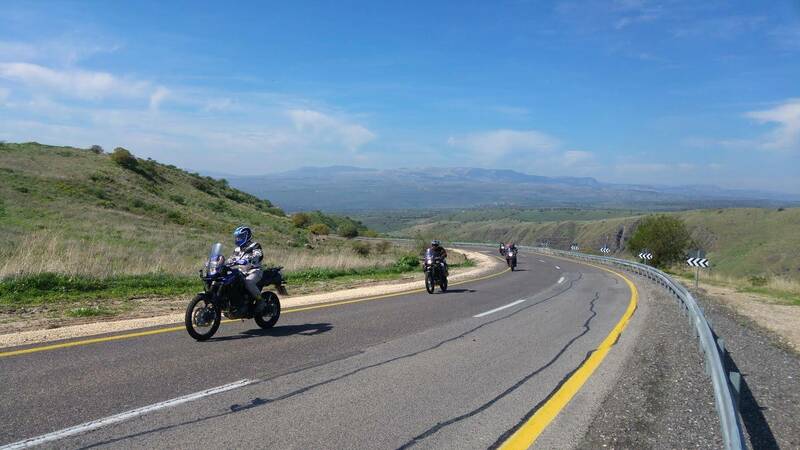 In the morning we will ride to visit the ruins of the ancient city of Beit Shean and then we will ride to the Gilboa mountain range through a scenic road that winds along the top of the mountain allowing great views of the valleys around where many biblical stories took place. From here we will ride to Jerusalem. In the late afternoon and early evening we will see some parts of Jerusalem. On this day we will visit Jerusalem and we will try to understand why Jerusalem is so important for the Jews, Christians and Muslims. We will visit the old city as well as part of the new city. Stay in Jerusalem. Today we will ride all the way to the lowest point on earth. Visit the Jordan river and the world heritage site of Masada, a 2,000 year old fortress. Then we will descend to the Dead Sea. Overnight at the Dead Sea area. Rest day at the Dead Sea. Self-riding in the area is optional. In the morning we will ride to the Nabatian city of Avdat and learn how the people who controlled the incense trade for centuries lived in the desert. 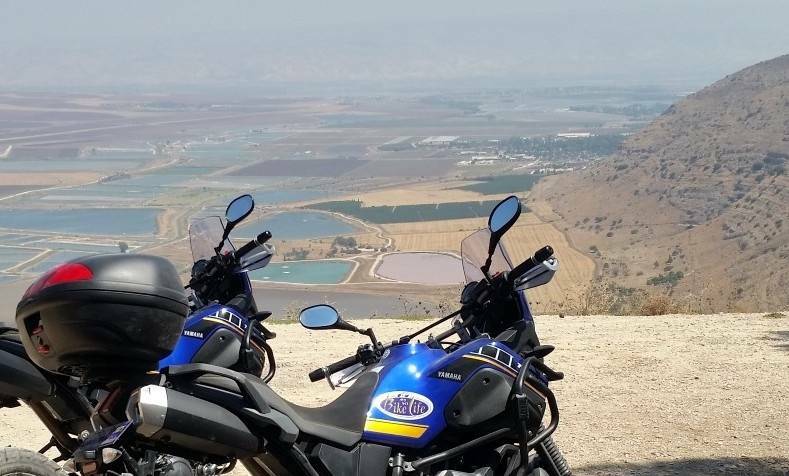 Then we will ride to Makhtesh Ramon, a unique crater like phenomenon, one of only 8 in the world. In the afternoon we will make our way to Tel Aviv. On this day we will visit the old city of Jaffa and some parts of Tel Aviv. Depending on the departure flight, we will either return the bikes and go to the airport or visit another site before returning the bikes and going to the airport. Akko, Tsfat, Sea of Galilee, Golan Heights, Caesarea, Jerusalem, Dead Sea, Masada, Jaffa, Tel Aviv.